In this class, you will take an off-the-shelf exterior light fixture and replace its existing glass with flat panels constructed during the class. This is home décor with a personalized touch! 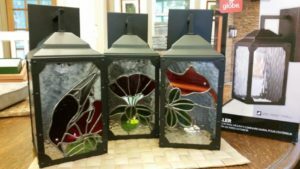 “Stained Glass Basics II: Exterior Lamp Project,” taught by Claudia McCall, will be offered on September 22, 23, 29 & 30, 2018: Saturday and Sunday from 9am – 12pm. Claudia will provide several patterns from which to choose, though students are welcome to bring their own ideas. You will complete this 4-session workshop with a finished exterior lamp, and the knowledge and experience of the basic skills involved to continue working with stained glass. Class fee is $100/$90 VAC members plus a $30 supply fee. An additional $30 supply fee will be charged for students who wish to purchase the light fixture from VAC. Anyone with prior copper foil stained glass experience is welcome to enroll. Attendees are asked to wear long pants, snug fitting gloves, covered shoes and safety glasses. Please bring a glass cutter and soldering iron if you have them. Advance registration is required and this workshop will be limited to 6 adults. Claudia McCall started working in stained glass in 2006, when a friend gifted her with a piece. She loved the way the sunlight played through the different types of glass, and wanted to explore the possibilities of interpreting the natural world, and interest spurred by her mother’s love of art and her grandmother’s love of birding. Her goal is to interpret Hawai‘i’s unique environment through the stylized lens of stained glass.